Since my first book signing people have asked for an audio version of my books. Yesterday the final episode of the audio version of The Crown Conspiracy went up on Podiobooks.com and iTunes and the best news…it is free. The term podiobook was coined by Evo Terra to describe serialized audiobooks which are distributed via RSS, much like a podcast. Listeners to Podiobooks.com can choose to receive the episodes of their books via an RSS feed or by listening to episodes by directly downloading episodes from this site. Some listeners keep the audio files on their computers, some transfer the book to CD, but most transfer the file on to their MP3 player so they can listen no matter where they are. Why are authors making these versions available for free? Many authors do this to get exposure for their work, others do it in the hopes you'll buy a physical copy of their current or perhaps next work in development. Still others simply do it for the sheer joy of writing. And while it's not required, you have the option to donate money to the author of your choice. When you consider that audio books run usually twice as much as their hardcover counterparts... we hope you'll be generous. Authors receive 75% of all the proceeds from the donations from listeners. The smaller portion goes to the maintenance and upkeep of Podiobooks.com. Nathan Lowell, the author and reader of some of the most popular books on Podiobooks.com volunteered to produce the audio versions of the Riyria series. He has an amazing reading voice and has done just an excellent job putting this together. In listening to his rendition, I found myself sitting back captivated wondering what would happen next. Hearing him voice characters and interpret lines, made me think this is what it must be like, at least to some degree, to see a movie version of one’s book. It comes alive in a way I never expected to experience. It also called into question the exact pronunciation of every word and the sound of accents. With this experience, I can only imagine the insanity of trying to make a film and all the questions that would come up. As it is Mr. Lowell made the process extremely easy. His professionalism, talent, and experience really blew Robin and I away. He managed to get nearly all the words right from the start, and his handling of the work was truly marvelous. I found myself lost in Nathan’s dramatization and laughing at jokes, more for his presentation than how I wrote them. I also found myself fascinated at some of the writing, wondering if I wrote that. I guess it just sounded better when spoken aloud by a talented reader. This release is the first venture for Royce and Hadrian outside of the world of print and it is quite exciting. So drop by either iTunes or Podiobooks.com, download the episodes and experience the adventure all over again. You can expect to hear Avempartha sometime this winter. Two Thieves Have Other Plans. The New Empire intends to celebrate its victory over the Nationalists with a day that will never be forgotten. On the high holiday of Wintertide the empress will be married. Degan Gaunt and the Witch of Melengar will be publically executed. Then the empress will suffer a fatal accident leaving the empire in the hands of the new emperor. It will be a perfect day. There is only one problem—Royce and Hadrian have finally found Degan Gaunt. For those just tuning in, Wintertide is the fifth book in the six book Riyria Revelations series. It is scheduled for release in October, and just as recent as two weeks ago I wondered if it would make it. I wrote all six books in the series before the first was published. I wrote them as one story divided up into episodes. So if you can imagine, I dreamed up this grand tale and then figured out how to break that down into smaller book-length stories with their own beginning, anti-climax, climax, and end. Then I wrote it straight through, one book after another finishing the last one during the period following my signing a contract to publish the first book, but before it was released. Now when I wrote them, as I completed each book, I went back and edited each. I looked for mistakes certainly, but I was really looking at “how it read” and to be certain that the pacing and the story worked. I wasn’t studying the grammar or searching for consistency of names and such, because well, at that time I never dreamed I would be publishing the books and assumed only three people might read them, so why bother. That’s the way it was with all the books. I wrote The Crown Conspiracy in a month (September of 2004) and I wrote Avempartha in the same length of time in the following month (October 2004) but as you might guess, writing at that speed, the books were not perfect. It wasn’t an issue because I never planned to send either to an agent or publisher. I slowed down a bit as I wrote Nyphron Rising taking three or four months to write it, and Emerald Storm was interrupted by our move to the DC area, which left the book in a year-long dormancy. 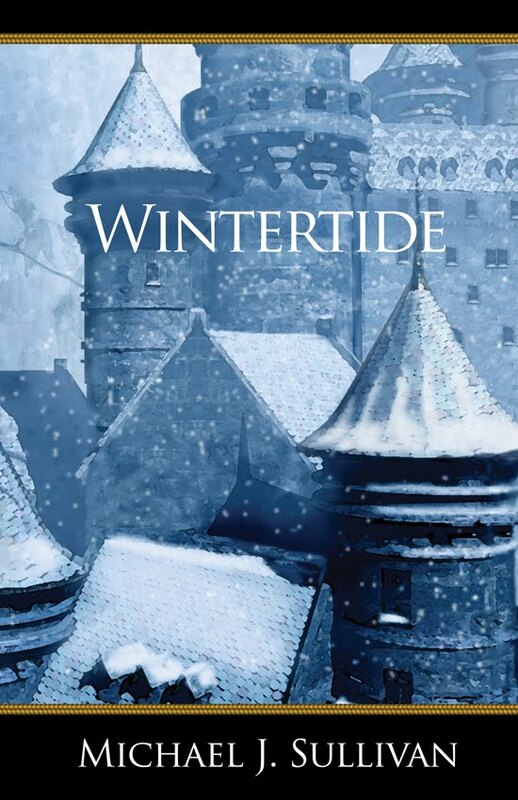 Wintertide was the first book I fully wrote in Virginia. The first book I wrote after obtaining an agent who gave me the ego boost of saying the books were publishable. The first book I wrote after having learned some fundamentals about writing that I was missing, that my agent gently informed me of, and for which I will always be grateful. As a result, I felt my writing had improved significantly and this was supported by my wife Robin when, directly after Emerald Storm was released she picked up the manuscript for Wintertide, read it through, and proclaimed it was great and unlike the previous books would not require much work at all. You see, Robin is my first critic/editor. She always does the first pass and it is her job to find fault. I was therefore very pleased to hear that Wintertide would be a breeze to put out and looked forward to a summer vacation. Robin read the book through three or four times and each time she found new problems. I’m not talking about using “that” when it should be “which” or using the wrong form of “lay” or my infamous use of “starred” when I mean “stared,” but plot problems. As I said when I wrote the books I didn’t expect them to get published. The same is true of Wintertide. I had an agent, but that is like owning a lottery ticket—it’s a step closer, but it doesn’t mean you’ll win. There were a few aspects of the story I had never been satisfied with, and Robin found those. When she did—when I saw someone other than myself picked up on the same weakness, I knew it had to be changed. Luckily the problems are in-book issues and don’t affect the series as a whole, and center mostly on eliminating contrivances and strengthening character motivations. I read it through and agreed. It was a mess, but now that she had revealed the flaws, they had to be addressed. And while her solutions were logical and structurally sound, they reduced the story to the spectator sport of drying paint. Reading it was like driving a car with a serious imbalance in the wheels. The pacing was way off and suffered from the unforgivable sin of being boring. I took the pile of tattered pages, crumpled, stained and scribbled (metaphorically as it was really a heavily marked up doc file) and right in what should have been my summer vacation (I look forward to one every year, but it never seems to materialize,) with less than a hundred days left before the scheduled release, I began literary CPR. Sequestered in my office, fortified with coffee, I tried to sew up the damage, but it wasn’t working. I was losing the patient. The more I tried to smooth out the bumps the worse it got. Eventually I scrapped the whole first half of the book and started over. I went all the way back to reworking the story at the outline level, forcing myself to forget how the story had been for years and re-envisioned it. For me this was a little like trying to forget ten years of your life and imagine something else happened instead. Over the course of one very long day, I paced, I walked, and I pondered as I reconstructed half the novel. By the end, I had a new outline. I showed it to Robin, who was dubious. Sigh. I don’t like writing under pressure. About ten days later it was done and I handed it off to Robin. I had no idea. Like the myopic builder of a skyscraper, I waited to find out what I had done. Back and forth it went after that, problems found, problems fixed until at last the book felt sturdy enough to allow a new set of eyes to judge it. We waited as our friend, and new Ridan intern, Annie, read through the newly revised version. We braced ourselves expecting the worst. Turned out the “but,” while important, was relatively minor and easily corrected. Actually there were many “buts” and it took the better part of a week to hammer out each. The issues at stake were small, and in some cases, perhaps unnoticeable by the average reader, but each was debated between Robin and Annie over our dinner table with all the passion of two trial lawyers working a murder case and leaving me to make the decisions. Yesterday the last changes were finished and the new improved Wintertide has finally entered the line-editing stage. The building is over and the sanding has commenced. By August I hope the polishing will begin and by October, if all goes well, Royce and Hadrian will ride again. A funny thing happened after I was published and the books gained some traction. I started receiving requests from people asking for help. When I was an aspiring novelist, no one ever asked me for help. Overnight that all changed. Some people have asked me to mentor them, one even offered to pay me. Most folks just ask for feedback on a story, or advice on getting published. More recently, I’ve been asked to provide quotes for the backs of books, and a few people have even asked me to do book covers for them. One woman recently asked me to write a comment for a Library fund raiser—being the apparent household literary name that I am. Unless I’m really busy, (like this past month) I usually manage to help out. Robin’s the same way. She loves to help writers. Being married to one she knows the heartbreak and elation that comes with the curse. As a self-made expert on the publishing industry, she took over a writer’s group that was about to be disbanded for lack of a leader and began giving a series of lectures on how to get published, find agents, or even self-publishing. She doesn’t charge money, even though she pays the meetup.com people for hosting the group, and prints handouts and such. It takes a lot of her time, both in preparing the material and the lectures themselves which go on for hours as people linger to ask questions. The idea of charging aspiring writers for anything is like thinking of slapping a beaten dog. Not only does it not feel right, it’s how you know they expect to be treated making it even sadder. As for ourselves, Robin and I aren’t the type of people to ask for help. We come from relatively poor families and went out on our own at a young age, paying for our own wedding and college, scrapping together our house down payment, and taking in boarders to make ends meet. It has made us very self-sufficient and self-reliant. When it comes to my books we’ve done virtually everything ourselves, making mistakes along the way and hopefully learning from them. We don’t begrudge having to work hard, it is through hard work that one obtains a sense of accomplishment. And the publishing industry has given us plenty of challenges to overcome. So, while we don’t ask for help we do spend a lot of time helping others. We aren’t saints. We don’t go out of our way to find people in trouble, but when I was a kid, I remember my father never passed a car stuck in the snow or broke down without offering help. I think I inherited that trait and even circled back on freeways when I missed a stranded motorist because I didn’t see them in time and was caught off guard. As we’ve gotten older, I’ve found helping people who appreciate what you do for them is far more rewarding than making a boat load of money from people who could care less. Is it any wonder I’m a novelist? Then came a metaphorical knock at the door. Several actually. People offering to help. At first it was the bloggers who promoted my books, then fans (some professional editors), began asking to help edit the manuscripts for free—my secret beta army. Most recently however, there have been three developments that have blown us away. First, Nathan Lowell, author of the Solar Clipper series, (Quarter Share is the first in the series) and Podiobooks phenomenon, has offered to record The Crown Conspiracy into audio for me. Mr. Lowell is a fantastic talent, if you want to be totally swept away go listen to his books on podiobooks.com, they are free but after enjoying them I’m sure you’ll put a donation in the tip jar. I am amazed at the man’s generosity. He’s already begun recording and what I’ve heard so far is wonderful. Through a series of strange developments where one person told another and so on, I have found a new Foreign Language Rights Agent who is closing a deal with a major publisher in the Czech Republic, before she begins following leads in other countries. Assuming everything works out as it appears to be, I will be paid my first advance by a publisher. Lastly, and while clearly the most tenuous, it holds the most outlandishly exciting prospect. An individual I met accidentally, with successful ties to the motion picture industry, has agreed to turn The Crown Conspiracy into a screenplay with the intention of getting a movie deal. It might be like trying to get to the moon by building a giant slingshot, but hey, it’s a chance. All of these things have come about unsolicited. Offers of assistance out of the blue. Even if nothing comes from any of this, for a guy who’s ultimate goal was to sell a grand total fifty books to people he didn’t know, this is pretty amazing and a confirmation that what goes around comes around.